The last paragraph of ‘Dismal Science’*, the essay that is at the heart of Allan Sekula’s legendary Fish Story project - comprising photographs, slide projections and a book - does not provide closure of any kind. Rather, in all its haunting and taunting, it provokes further interactions and interventions. It activates, which is perhaps what all forms of activism aspire to. If the cargo container, this metal box that is at the same time ever-present and never-disclosed, really is the coffin of remote labor-power, then there is still much digging left to do. 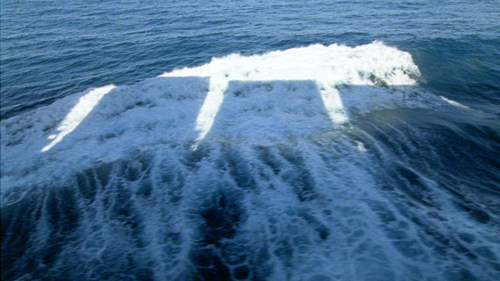 Sekula himself never abandoned his quest over the world’s oceans and his investigation of the labour aboard its ships and in its harbours: twenty years after commencing the monumental work of Fish Story (1989 - 1995) he made The Forgotten Space, together with fellow companion Noël Burch. While the first project was still haunted by the collapse of the Eastern Bloc, the latter resonated with the economic crisis of 2008. In the aftermath of this crisis it was made clear for all of us that, in twenty years time, capitalism had lost nothing of its “vampiric vitality”. On the contrary: it has learned to make the exploited pay for its crises, all the while rendering the fact of exploitation itself invisible. In the dominant image of the world economy as fully integrated, globalized, dematerialised and “friction-free” there is no place for old industrial relics such as sea trade, this ancient world of rusty metal and creaking ropes, of slow motion and ponderous weight. To all appearances, the “on the waterfront” culture of sailor bars and ship chandlers, as depictured in Elia Kazan’s eponymous film, is now of the past, and so is the class struggle that coincided with it. Who remembers the struggles of dockers, seafarers, and shipyard workers, which were so fundamental to the formation of trade-unionism and labour movements? Watch today’s news and see how easily this world is denounced as an anachronism that merely stands in the way of progress and prosperity. How easily we forget. In these “liquid”, post-industrial times of ours, we have no trouble floating in mid air, riding the global waves of capital, surfing the fluid flows of information, but we forget how globalization wouldn’t be possible if it wasn’t for the forgotten space of maritime realms. And we forget that what the shipped coffins contain is manufactured by workers on the other side of the globe. Because, in contrast to what we are being told, Marx’ gravediggers have never disappeared - they have just vanished from sight, forced into ever more precarious circumstances, oftentimes on the far side of the sea. Should we be surprised to learn that the same shipping containers are increasingly used for human transportation and habitation? No, but we should be all the more outraged. As Noël Burch and Allan Sekula were when they made this film, which can only begin to suggest the extent of the horror caused by globalized capitalism. * The essay ‘Dismal Science’ developed from a paper first presented at the Center for Twentieth Century Studies at the University of Wisconsin, Milwaukee in 1992. Versions of the original paper were subsequently presented over the next two years at various venues. The completed version was included in the book that accompanied the Fish Story project. Unfortunately, the book has gone out of print, and the current cost of copies ranges from $500 to over $1000. However, you can find a PDF copy online. In het filmische essay The Forgotten Space verkennen fotograaf-filmer-schrijver Allan Sekula en de Frans-Amerikaanse regisseur en filmhistoricus Noël Burch de zee: ‘de vergeten ruimte van onze moderne tijd, waar globalisering op de meest prangende wijze zichtbaar wordt’. De film vertelt over de triomftocht van het containervervoer via de zee (goed voor meer dan 90% van het wereldwijde goederenvervoer) en beweegt zich tussen vier havensteden: Rotterdam, Bilbao, Los Angeles en Hong Kong. Ze brengen vooral de kleine verhalen en de wijze waarop de globalisering lokale gemeenschappen, arbeiders, boeren en consumenten beïnvloedt.